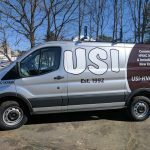 USI Equips All Personnel With Apple iPad Tablets - USI - Ultra Services, Inc.
USI has recently equipped all of our field technicians and sales personnel with Apple iPad Tablets. By implementing iPads and a more digitally-based system, our service and installation technicians will be able to communicate with the main office in a more resourceful manner. Equipment lists, job site history and other useful information and tools will be readily available to our field personnel with the press of a button. USI’s Sales Engineers and Project Managers will also be equipped with iPads, making building plans, project plans/designs and more available at all times, without the bulk of paper. The utilization of iPads will allow our Project Managers to be on every job site at all times with our technicians in a virtual sense. This in turn will lead to faster follow-up proposals, more comprehensive reports and the absolute best service possible delivered to our customers. This rollout will greatly lend to our Go Green initiative within the company. By incorporating and utilizing an all-digital system, USI’s use and dependence on paper will be greatly reduced. On average, 20lbs of paper will be conserved daily, equating to roughly 5,200lbs of paper over the course of the first year. At USI, our mission is to serve our customers more efficiently and effectively than anyone else by treating our customers as we personally would like to be treated. We believe in providing the greatest value possible by offering first class service as well as uncompromised quality at a competitive price. USI is accustomed to tight deadlines and special situations. USI is ready to help you eliminate expensive downtime, save on energy costs and extend the service life of your HVAC systems and equipment.